How has Narendra Modi performed so far as India’s prime minister? Narendra Modi will complete his first hundred days in office on September 3, 2014. So far, 73 days into his first hundred days in office, Modi has defied expectations — and not in a particularly commendable way. As Victor Mallet notes astutely in the Financial Times, Modi’s supporters are “disappointed by his near-silence on domestic matters, his obsession with foreign affairs and the absence of ‘big-bang’ economic reforms after a decade of lackluster Congress rule.” His critics, meanwhile, haven’t quite yet gotten the reenactment of the 2002 Gujurat riots they were expecting (if India’s pre-election hysteria is to believed), nor have they witnessed a surge of Hindu supremacism. Modi is neither a superman nor a supervillian — he’s just another prime minister working within the normal constraints of everyday politics. For a country swept up by “Modi Mania,” the prime minister’s performance in his first hundred days is perhaps best symbolized by his government’s budget: a document that was controversial because it was mundane. Instead of delivering on a distinct BJP vision for India, riding on a wave of popular support following May’s election, the budget devolved into a bureaucratic exercise in non-reform, suggesting to many that it would take a greater strongman than Modi to lift India out of its current economic slump. The canonical example of a leader pushing through ground-breaking reform in their first 100 days in office is, of course, Franklin D. Roosevelt. Modi’s supporters perhaps expected too much from India’s political architecture if they expected that caliber of reform. Despite the BJP’s historic parliamentary majority, Modi’s government has found itself bogged down by a lack of vision and energy, as well as bureaucratic paralysis. What is curious, and what took many India watchers by surprise, is Modi’s emphasis on foreign affairs. Here, the man has been a dynamo, setting himself apart from his quiet predecessor. 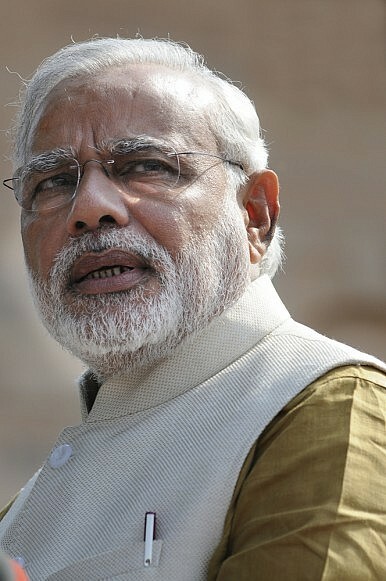 Modi was noticeably tight-lipped on foreign affairs during his campaign for prime minister. In an interview before the election, Modi suggested — with reference to comments he’d made on Pakistan — that remaining silent on foreign affairs during the campaign was a strategic play. Since coming into office, Modi has demonstrated his commitment to restoring India’s leadership within the subcontinent and on the world stage. We first caught a glimpse of his foreign policy ambition when he invited all SAARC leaders to his inauguration. Since then, with trips to Bhutan, Nepal, and Fortaleza, Brazil for the BRICS Summit, and with planned upcoming visits to both Tokyo and Washington, Modi has constantly shown that India’s foreign relations are a priority for his government. For his critics, Modi’s silence on troubling domestic phenomena, including communal violence in Uttar Pradesh and other social issues across the country, vindicates their view of him as a leader poorly suited to lead a pluralistic country. Opposition politicians have similarly alleged that since Modi’s rise to power, communal violence has spiked across India — an assertion that is apparently not supported by the latest data from India’s Home Ministry. Others have latched on to Modi’s supposedly anti-democratic tendencies, including his refusal to entertain the media and his effort to avoid interviews. Even Modi’s more moderate critics, who would have been pleased to see the BJP-led government take swift action on issues such as corruption and India’s fiscal unease, have little to applaud at this point. To be fair to Modi, his government does have some domestic policy accomplishments to its credit at this point — though none are the sort of heavy-hitting panacea that many hoped for. To fight corruption, Modi’s government has set up a Special Investigation Team to retrieve Indian capital from abroad. The government has additionally issued mandates prohibiting nepotist hiring practices with the government. Modi’s government also launched the “MyGov” e-governance portal that allows Indian citizens to directly interface with the government on topics of interest. His government established a new ministry to promote citizen-driven economic growth: the Ministry of Entrepreneurship. Additionally, the Modi government is expanding the amount of allowable foreign investment in defense projects. While each of these initiatives has been lauded by some, they do not in sum represent the degree of reform Modi’s supporters expected. His critics, meanwhile, lament the government’s priorities. On one hand, it was perhaps inevitable that Modi would be unable to “quickly fulfill [either] the fervent hopes of his fans [or] the worst fears of his detractors,” as Mallet notes. Given the nature of Indian politics, reform is often slow-moving and immune to the whims of individual leaders. However, despite his failure to deliver and growing frustration among Modi’s supporters, it would be unreasonable to write Modi off this early into his tenure as prime minister. His focus on foreign affairs over domestic matters represents a recognition of the fact that India can only grow as a regional leader and globally integrated economy. On domestic issues, both economic and social, Modi’s approach is looking to be quieter and more gradual. In any case, it’ll take far longer than just 70-odd days to nurse a country of 1.2 billion into good economic health.